Honolulu Magazine’s Hale Aina Awards ballot is now online and The Pig & the Lady is up for 5 awards -- Best Oahu Restaurant, Best Cocktail, Best Vietnamese, Best Business Lunch, and Best Dessert -- Plus, Piggy Smalls is up for 1 award for Best New Restaurant! We were ecstatic and humbled by the wins we won last year and it just represented a manifestation of accolades that our dedicated and hardworking team could be very proud of. If you are a fan of ours and believe in what we are doing, please consider voting for us again this year. We are also on our regular schedule as well. To see the schedule and full menu, head over to the Farmers Market page. Have you seen our weekly '80s music video homage hyping up our weekly softserve flavors? This week's video is "Whip It!" by Devo. They're zany and we have a lot of fun making these videos. Check them out on our Instagram every Monday! We can’t believe we are the midpoint of 2017 already. Man, time flies! This past May was quite busy for us — Mothers Day brunches, various catered events, Memorial Day weekend, etc. Since we are on the topic of Memorial Day, we want to thank all the brave men and women who serve our country and keep us safe. Their sacrifices, determination and hard work are truly appreciated! As always, you can check the full schedule and menu over at the Farmers Market page. Pho Sot Vang -- Our famous pho cooked with red wine braised beef brisket. As the month of May sunsets and we head into the summer season, we want to thank you all for continued patronage. We had an eventful month, which included a successful Mothers Day weekend. It was so great to see so many moms and their families celebrate with us. We've got more in store this summer with some upcoming updates, so as always, read this blog or follow us on social media! As always, you can also check out the full schedule and menu over at the Farmers Market page. Have you seen our latest music video parody this week? We harken back to the '90s where MTV actually played music videos! Remember Mentos? You just pop one in your mouth and voila, jam undone!! The Foo Fighters took it one step further with 'Footos' in their "Big Me" music video and now we at @pigandthelady are continuing the legacy with magical sweets with this week's #PIA softserve "TOASTED MACADAMIA NUT CUSTARD & PINEAPPLE GINGER SORBET" Just one bite will transport you to a simpler time called the '90s that'll wash all your troubles away, even the wrath of chef and owner Andrew Le! "Oooohooohooo!!!" To see the full video, head here. Per usual, we are on our regular schedule at the farmers market. Also, don’t forget to make your Mothers Day plans, and hopefully, they’re with us! We will be serving a special Mothers Day menu this weekend. To check out the full menu, times and to make reservations, head over to our Mothers Day page. In the meantime, in regards to the Farmers market, check out the full schedule and menu over at the Farmers Market page. The cleanest tasting uni I ever had. As always, the full schedule and menu is over at the Farmers Market page. After the torrential rains that pretty much destroyed our booth at KCC two weekends ago, we are back in business! First things first, The Pig & the Lady Chinatown location will be closed from February 27 through March 2 (for lunch, and will re-open for dinner that night). The chefs need a much needed mini-vacation. It’s short, but necessary for them to rest up and come back rejuvenated. As always, our full menu and schedule is over at the Farmers Market Menu page. Valentine's Day is next week and The Pig & the Lady is going to be hosting a special Valentine prix fixe dinner menu for all you lovebirds on Valentine's Day, Tuesday, February 14. The set menu is online now and we are also offering a vegetarian menu. From the creative mind of our Chef de Cuisine Keaka Lee, this year’s menu can best be described with one word, “sensual.” Please call the restaurant at (808) 585-8255 to make a reservation. You can view the complete menu (with vegetarian options) over here. Meanwhile, Piggy Smalls will be hosting a PAL-enstine’s Day Dinner on the same night! Come with friends, come with family or just come alone... you'll never know who you'll meet. Our menu is designed to be fun and shared, which you can view here -- Reservations only. Call us at (808) 777-3588 or email us at info@piggysmallshawaii.com to save your seat and meet other singles and become friends (or "pals")! 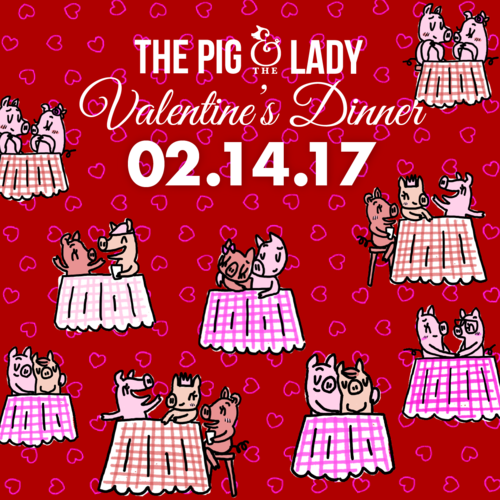 To make reservations for Valentine’s at The Pig and the Lady, click here. Or if you want to celebrate PAL-entine’s and rebel against tradition, or want to celebrate with all your single friends, then you can make reservations for this special night at Piggy Smalls by clicking here. BO LUC LAC — cubed ribeye steak, grilled with garlic and mama's specialty marinade, waipoli butter lettuce, red onions in vinagrete. As always, check out the full menu and schedule over at the farmers market page. The video is an independent production of Orlando Benedicto. Valentine's Day is right around the corner and as always, and The Pig & the Lady is going to be hosting a special Valentine prix fixe dinner menu for all you lovebirds on Valentine's Day, Tuesday, February 14. However, who says Valentine's can only be for couples? Come eat with us at Piggy Smalls for our "Pal"-entine's Dinner! Come with friends, come with family or just come alone... you'll never know who you'll meet. Our menu is designed to be fun and shared, which you can view here -- Reservations only. Call us at (808) 777-3588 or email us at info@piggysmallshawaii.com to save your seat and meet other singles and become friends (or "pals")! To mark this occasion and celebrate singledom everywhere, check out this promo video starring our very own Chef Brandon Lee. Move aside, Gosling, there's a new himbo in town. To paraphrase Kanye, Brandon is all about the 808s and heartbreak. Deadline to place your orders is this Friday, February 3, To pre-order your Superbowl takeout kit, head over to the reservation page! MI QUANG — pork belly, chicken, shrimp, quail egg, lobster balls, aromatic herbs, turmeric rice noodles, pork & anato seed broth, topped with shallots , roasted peanuts and a sesame chip. As always, you can check out the schedule and full menu over at the Farmers Market Menu page. New dinner menus for both The Pig & the Lady and Piggy Smalls debut this week! We highly recommend them, especially the silkie chicken pho. Silkie chicken are a particular breed that is very unique for its black skin and bones. Eaten during New Years for good luck!! The flavor that comes from this chicken is elegant and deep. If you haven’t tried it, then it’s a definite must! As always, the full menu is over at the farmers market page. Last week, we had a great time at Outstanding in the Field and our collaboration with Chef Renee Erickson of Sea Creatures and Bateau fame. Her and her team from Seattle are absolutely amazing and they were all lovely people. It was also a great honor to rub shoulders and work alongside a James Beard winner. It was humbling and a truly great experience to collaborate and serve in one of the most picturesque and iconic locations, Ku’uloa Ranch. BUN THANG — A Northern Vietnam New Years noodle soup of all jullienned ham, egg, chicken, shiitake, pickled daikon, rau ram and mint, vermecelli noodles, chicken broth. We are so honored to be collaborating with James Beard winner Chef Renee Erickson from Seattle and Taylor Thornhill this Tuesday at the Outstanding in the Field dinner located at Kualoa Ranch. We are longtime admirers of them, with their amazing establishments Sea Creatures and Bateau. They are required go-to locations to dine at whenever in Seattle. For more info on this event, head over to the event page and we will also be posting pics from said event on our social media so keep an eye out for that. As always, the full menu and schedule is over at the Farmers Market Page. Have a great week!